A race, interrupted training and the new year. So I ran the race. And I loved it. I never really understand that I don’t race much, have to be coaxed into racing and then when I do it I love it. Why do I resist doing something I enjoy? Most times (London 2013 was an exception) I am beaming from ear to ear, just soaking it all up and enjoying the sensation of running with others and pushing myself. The Bedford Half marathon was no exception. It was cold, windy and wet (some wet snow blew at us sideways as we were shivering at the start) but, of course, fine once we started running. Given that my training had been sub-optimal, I ran without my Garmin and instead focused on just pushing myself. It was weird – I haven’t raced without a watch since I’ve owned my Garmin which is going back some 7 or so years now I think – but it was good. The course was hilly and I just kept on focusing on pushing – slightly. I ran a few miles with a runner who tried to talk me into doing the Marathon Des Sables one day (he planted a seed, it’s slowly fermenting at the back of my brain) but when I noticed I was talking too easily I picked up the pace and went off. After that I just kept – slightly – pushing myself, mindful that I was not in amazing shape and hadn’t run the distance in a while either. It was one of those days where the miles just ticked off and I was just out enjoying myself, so glad to be out there. The final mile even brought me a duel with a much younger runner in shorts and club vest (snap judgment = keen and cocky) and I enjoyed beating him across the finish line by a few seconds. Showers and a new fleecy hat (better than a medal? Discuss) and Sal and I were on our way home. A day later I was out with a client on an evening run when I misjudged the location of the pavement and twisted my ankle. I was able to finish the run (and was amazed by that) but by the middle of the night the pain woke me up and was excruciating. Amazingly, I was able to hobble around for the next few days (no running) and deal with an exceptionally busy week in my personal life which involved driving to London and back, spending a day driving around London in a rental van picking up and moving furniture around and a morning training at Sweaty Betty HQ to learn the moves on a new class I will be teaching late January / early February . Look ahead a few days, my ankle felt better and I demonstrate an exercise to clients with weights that were far too heavy to be appropriate (because I was too lazy to jog to my car to get the lighter weights. Yes. I am a personal trainer) and boom – I can barely walk for days because my back is so painful. Off and on with these various self-inflicted shenanigans, it was not till after Christmas that I managed to get back into a schedule again. It felt hard. It was hard! Getting back to it seems to mean, inevitably, that you have to trudge for a while. That it feels hard and does not look pretty. But I know that. New Year came a bit slowly to me – the logistics of planning and organising a fun party, the aftermath of having a fun party – it all meant I felt a little bit left behind by the good intentions on social media and in the newspapers – it wasn’t till about January 6th that I started to think about resolutions and the new year. Thankfully – unlike Christmas – I never think of the new year as a being a one day thing. I think you have all of January to wish someone a happy new year, and to think about the new year and what it’s going to be for you. And given the overflow of diets / exercise plans / resolution systems that you can find in the papers and the internet made me think of the typical “get fit and lose weight” resolution that so many have. And to reflect that I’ve done it. 11 1/2 years ago I made up my mind, for the umpteenth time, to lose weight and get fit. And unlike the umpteen times that preceded that day in July 2003 – this time it worked. In the course of 3/4 months I lost about 18 kgs of weight and started a running habit that was brand new to me and that has carried on to this day. 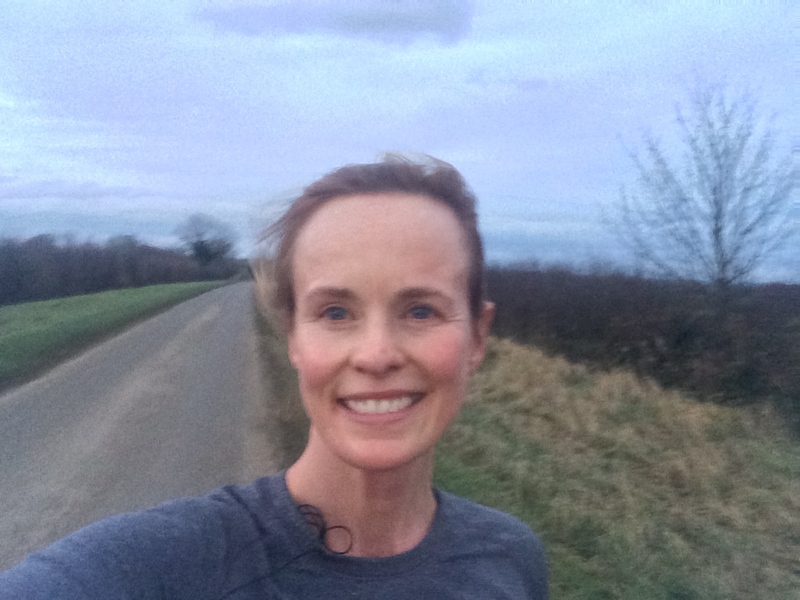 Out on a long slow run – where you have time to think about anything – I was wondering what the secret was – what it was that made my intentions stick that time. And you know? The only answer I can find to that is that I just refused to give up. Every time I fell of the diet wagon I refused to do what I’d done before, which was give up. Every time I made myself start again. And every time I didn’t run for a day, I refused to think that that was the end of me running. I made myself go out again the next day. And ultimately that – that is what changes a habit I think. The getting back at it. The getting back on the wagon. The refusal to let self-defeating thoughts (“see? I’m not the kind of person who’s meant to lose weight”, “see? I’m not a runner”) stop me from getting back out there. Eventually it sticks. I don’t believe there is one diet, one way of eating, one way of exercising. But when you find a way of eating more healthily that works for you, that you can keep coming back to even when you slip up, a form of exercise that you can get back into even when you stop doing it for a while – then you are on the way. Not necessarily to a slimmer, faster you. That might not be what you’re looking for. But you’re on the way to living a part of your life in a way you want to live it. A hugely powerful and self-defining feeling, that. So 2015 is a year I’m looking forward to. I’m loving my work and the people I’m meeting through it. I’m back at my training and I have 2 marathons to look forward to this spring. I’m still looking for and brewing up suggestions for another BHAG for this year or next year. For the first time since July, I’ve thought about doing another IM in a few years. Who knows? There are so many exciting challenges out there – I can’t wait to get started. Happy new year! Previous Post On running a crappy race and why you should do it. Merry New Year pretty lady! I’m sure 2015 will be one for the books.